Since I started writing this blog, every January, I've written a list of restaurants I want to eat at in the coming year. To be honest, it’s more of a wish list than a serious declaration of intent; at the end of each year I rarely cross off as many as I’d like. Last week, in a shocking break from form, I managed to squeeze in lunch at Arbutus, a listed restaurant, and in one bold stroke return some order to my chaotic universe. 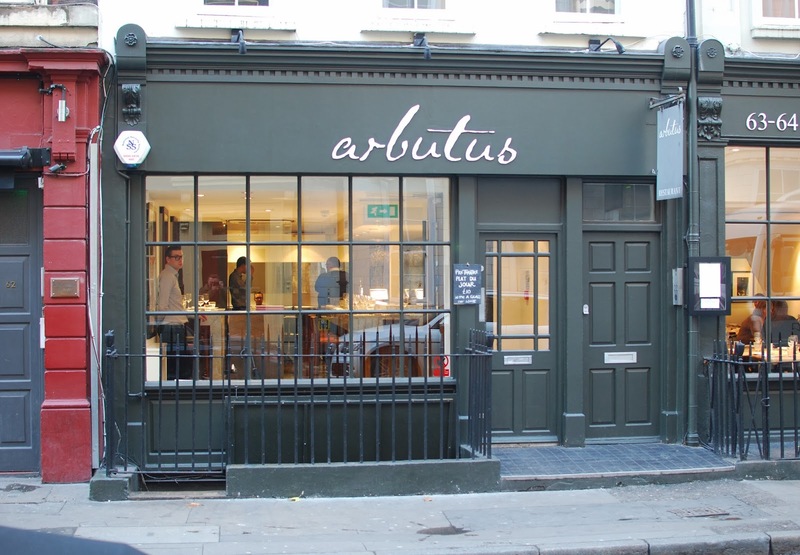 Arbutus is somewhere I've wanted to eat at for quite some time, mainly because I'm a massive fan of Chef, Anthony Demetre’s recipe book, ‘Today’s Special’ which is absolutely cracking, full of beautiful yet refreshingly rustic food. Definitely buy it if you don’t already own it. 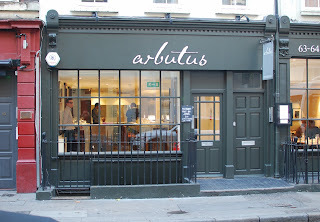 As you’d expect in a Michelin starred Soho restaurant on Thursday lunchtime, Arbutus was packed to the rafters with well-heeled looking media types when I arrived. Taking a seat in the plain, but pleasant feeling dining room, I’d more or less decided what I was going to eat before looking at the menu, feeling decidedly less flush than my fellow diners, I’d opted for ‘The working lunch’ set menu. Not that the a la carte is particularly expensive, it’s not, but what with Christmas approaching and an ever growing horde of nieces and nephews to buy presents for, I’m all about affordable treats right now. My starter of hand chopped Scottish beef tartare was beautiful to look at and astoundingly good to eat. The steak had a fantastic texture, spiked throughout with the sharpness of the chopped capers, gherkins and the heat of mustard and Tabasco. Forked through with a rich raw egg yolk and spread on a slice of charred sourdough. Absolute heaven. One of the best things I’ve eaten all year. Some people are a bit squeamish about eating raw steak and egg . If that’s you and you’re in a very good restaurant (definitely not a dish to get stuck into in your local Harvester) and steak tartare is on the menu, I urge you to order it. If you can get past the fact it’s raw, you will not be disappointed. Seriously. Don’t deprive yourself of the pleasure! I have a bit of a restaurant prejudice about chicken. I never order it. It always seems so safe, so boring and so easily overcooked and subsequently dry (God forbid its undercooked). Despite this; my hand forced somewhat by not fancying the alternative option on the set menu, I’d gone for the fowl. This arrived at the table in the shape of Black leg chicken, roast carrots, chestnut mushrooms and a side dish of potato dauphinoise. As is so often the case with prejudices, at some point you’re going to get them challenged and probably end up feeling like a complete chump. Yeah that’s me. The chicken was unbelievably good. The crispiest salted skin, rich moist flesh and the majority of the bones removed in a cheffy piece of butchery. Combine this with a creamy dauphinoise, crisp vegetables, a sweet carrot and cumin puree and deeply savoury gravy, it all adds up to me eating my words. Ordering chicken in a restaurant can certainly pay off. I decided to sidestep the set lunch menu dessert option, a warm English treacle tart with crème fraiche on the a la carte catching my eye. Can I just point out, I frigging love treacle tart. I’ve eaten it everywhere. I’ve made my own for the supper club a number of times to some acclaim. Believe me, I know what’s what when it comes to this particular dessert. 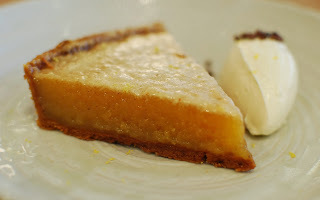 The treacle tart I ate at Arbutus was by far the best I’ve ever eaten, anywhere. Warm, just set, softly oozing sweetness on a beautifully crisp pastry base. As that first spoonful entered my willing gob and spread itself luxuriously across my tongue I was pinned to the seat, transfixed, radiating love for this dessert. It’s something of an understatement to say I thought it was pretty f*cking good. The bill, two set courses and an a la carte dessert and a couple of glasses of red, including tip £38. Which believe me when I tell you, is an absolute frigging bargain. The food, all of it, was just faultless, that steak tartare and the phenomenal treacle tart both vying for the best things I’ve stuck in my mouth this year. Add to this service which was at once friendly, pleasant, cheerful and entirely lacking any pretension and you have a near perfect lunch experience. Sarah - Thanks. Go, you'll love it. Glad to here it's still as good as when I went....ages ago. Been on my list forever! No excuse as I work pretty close, I WILL go soon! So you have a space on next years list for more of the same? His Wild Honey lunch is a steal, with ox cheek pie and greengage tart leaving Joan swooning. Jo - Yep. It's very good indeed. Coleman's Dad - Wild Honey is definitely on for next year. Ox Cheek pie and Greengage tart...doing some swooning of my own here!